Colin Geddes, Travis Stevens and of course our host Sam Zimmerman. Seven filmmakers gathered in upstate New York to workshop their new horror projects. Here, they reflect on what they learned. There are many filmmaking workshops, hosted by institutions ranging from Sundance to IFP, that allow emerging directors to assess their next projects with a group of mentors. Shudder Labs falls in line with that tradition, but comes equipped with a special focus: The new creative retreat is exclusively designed for horror directors. 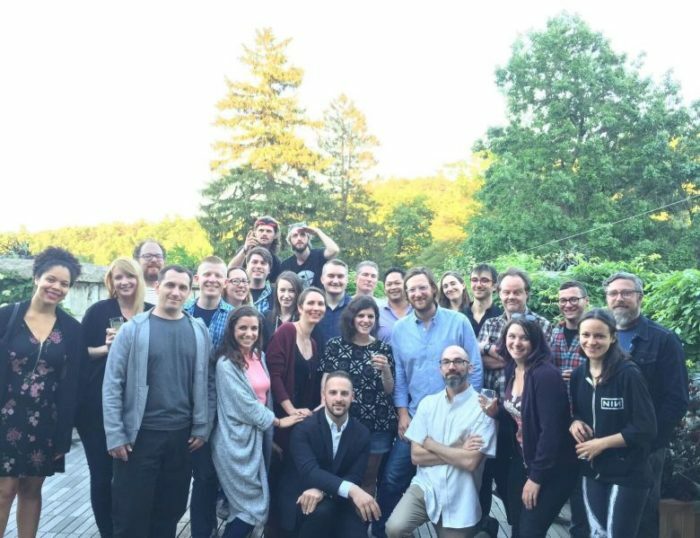 Hosted by Shudder, the horror streaming platform owned by AMC Networks, Shudder Labs was run by former journalist and curator Sam Zimmerman and took place June 11–15 at the Mohonk Mountain House. Seven filmmakers participated in the lab, taking guidance from mentors that included Sarah Adina Smith (“Buster’s Mal Heart”), Larry Fessenden (director, “The Last Winter”) and Lindsay Peters (Director of the Frontieres International Co-Production Market). The Masters-in-Residence were Mike Flanagan (director, “Ouija: Origin of Evil,” “Hush,” the upcoming Stephen King adaption “Gerald’s Game”) and Nick Antosca (screenwriter, “Channel Zero,” “Hannibal,” “The Forest”). Since horror filmmaking occupies a unique niche, IndieWire reached out to this year’s participants for a window into their experiences in the lab and how they’re evaluating their next steps as genre directors. Their responses are below, along with short details on each developing project. Plot Synopsis: When a young woman obsessed with beauty gets a job working for the trendy wellness company, Bloom, her obsession with their products plunges her into a nightmare world and sends her on a desperate mission to uncover what’s really inside their “all-natural” supplements. There were so many amazing moments, but I think the most inspiring was when we were talking about “mainstream” versus “artier” horror movies, and Larry Fessenden said: You should never think about making a movie that is a “mainstream” horror movie. You should only try to make the movie you want to make. Larry said horror is inherently subversive. It’s a genre that finds a way “into the cracks and around the corners” because the point of horror is to disrupt, unease and provoke. I loved that so much, and it’s what I think all art should do. Plot Synopsis: On the verge of starvation in the brutal Alaskan winter, a callused single mother and her eccentric son must find a way to save themselves and the isolated community they call home from a parasite that curses its hosts with insatiable hunger and libido. DV: Speaking with Larry Fessenden was the most valuable and inspiring moment at Shudder Labs for me personally. I respect his approach to filmmaking and he encouraged us to go into “Fishhook” the way we always wanted to. I was concerned that trying to shoot it on location would be too logistically difficult, but throughout our conversation he gave us a lot of practical advice, which I know will pay off when we begin to approach shooting the film. He also spoke with us about trying to make “Fishhook” even if we have to make it on a slightly smaller scale than we had originally planned. When discussing the scale of the film, he asked us, “Do you want to spend a year in meetings? Or do you want to spend a year making a movie?” That’s going to be our motto going forward. RE: Fear is a much more complex emotion than many people realize. It forces us to ask question of a dark existential nature, and causes us to look inward for those answers. By playing on a plane of universal relatability, horror allows storytellers to access themes ranging from the mundane to the macabre, will still keeping their audience on the edge of their seats.